THE UNEMPLOYED EATER: Sweet. LA's Best Soft Serve FREE In Tarzana Tomorrow. Sweet. LA's Best Soft Serve FREE In Tarzana Tomorrow. 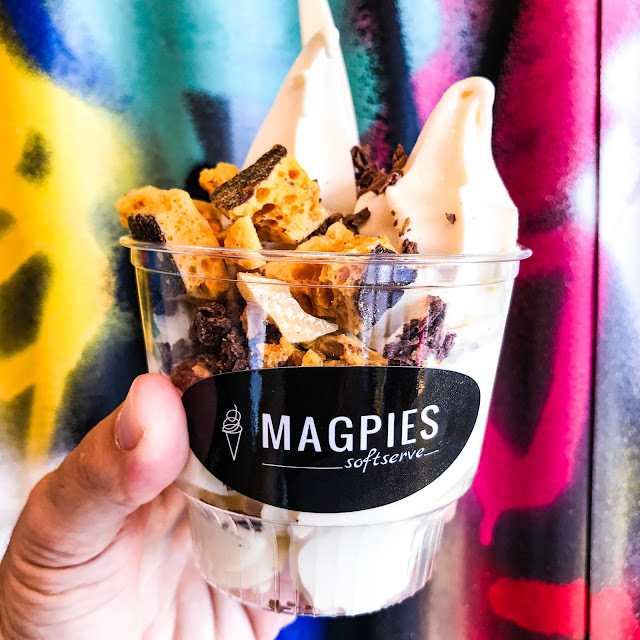 Magpie's, purveyors of LA's top artisanal soft-serve, opens their second Southland location tomorrow, May 9th, in Tarzana. To sweeten the pot: they are SWIRLING FOR FREE ALL DAY, 11am to 9 pm. That's right, the city's finest soft serve ice cream makers are coming to the heart of the valley, just in time for temps to the warm the eff up. And, to make sure you're aware, they're giving out their incredible product pro bono. For those who don't know about Magpie's... what's your problem? Where you been, bro? Founded by former Westside Tavern chef Warren Schwartz and his fellow culinary master wife, Rose, Magpie's opened in Silver Lake last year to much fan fare. Featuring half dairy and half vegan flavors that are so good you seriously can't tell the difference (I'm serious; their Corn Almond tastes as good, or better, than any dairy soft serve I've ever had), they rotate flavors often. If incredible 'cream wasn't enough, Magpie's also makes all their toppings in house, from scratch. I'm particularly fond of the Dark Chocolate Covered Honeycomb and Hazelnut Wafers. With a similar set up and menu, they open their Tarzana location tomorrow at 18971 Ventura Blvd with freebies all day. From henceforth, they will be open daily from 11-9.